The Senior U.S. investment strategist at the Goldman Sachs Abby "The Guru" Cohen and Former V.P. Al Gore are discussing the global economy. In speeches yesterday in Philadelphia, a Goldman Sachs strategist said the U.S. economy was not "the 1930s revisited," and Al Gore said short-term thinking had been catastrophic for capitalism. The economy is in an era of swinging between extremes, Goldman's Abby Joseph Cohen said at the Greater Philadelphia Chamber of Commerce economic-outlook breakfast. "In the course of six to nine months, many investors and many businesspeople have gone from one extreme, fearing rip-roaring inflation, to the other extreme, fearing the extraordinarily negative consequences of deflation," said Cohen, senior U.S. investment strategist at the Goldman Sachs Group Inc.
"Our belief is that we are not entering a period of dramatic deflation. We do not think this will be the 1930s revisited," she said. "A true deflation is when incomes deflate not just for a few quarters, as we expect, but for a multiyear period." Cohen said her firm predicted that the recession would end in six months or so, at least in terms of declining gross domestic product. Cohen said, spreads on "BBB" corporate bonds, the highest grade of junk bond, have increased to levels never seen before. Current spreads "imply that the default rate will increase four times. Now we think there will be problems in some corporate debt, but will the default rate increase four times? On average, probably not," Cohen said. Former Vice President Gore railed against the impact of short-term thinking on the environment and economy. "In the banking business, in the investing business, in financial services generally, this short-term thinking has been catastrophic, and it has now gotten to the point where our system of American capitalism is itself really taking a major hit," Gore said. He spoke at a Center City event hosted by state Treasurer Robin L. Wiessmann and sponsored by PNC Financial Services Group. "Vast areas of the financial system have been effectively nationalized now, and all around the world where they've looked to the United States as the leader of how we can organize democratic capitalism, the confidence in the American vision of how to do this has been shaken," Gore said. She was succeeded in the role by David Kostin, Goldman's U.S. investment strategist, spokesman Ed Canaday said in a telephone interview. Kostin today predicted the S&P 500 may fall 10 percent to 1,160 before rebounding to 1,380 by year's end. My Comment: Looks like Goldman replaced one perpetually bullish clown with another. Cohen, as chief investment strategist, last predicted the benchmark for American equities would end 2008 at 1,675, representing a 32 percent rally from its current level. My Comment: Let's do the math. The S&P closed the year at 903. Her call was 1,675. It will only take an 85.5% rally from the December close to get to her target. How long will that take? Five years? A decade? Longer? The 56-year-old Cohen now has the title "senior investment strategist" and contributor to the portfolio strategy team, according to Canaday. Her prediction for the S&P 500 this year was the highest among 14 Wall Street forecasters followed by Bloomberg. "She will continue to meet with our clients around the world and provide commentary on financial markets focusing more on longer-term market activity," Canaday said in an e-mailed statement. Excuse me for asking, but why would anyone want her advice? Some may suggest that one year is not a good basis on which to make a judgment. Fair enough. Guru Grades is featuring Abby Joseph Cohen, the Sunny Side. 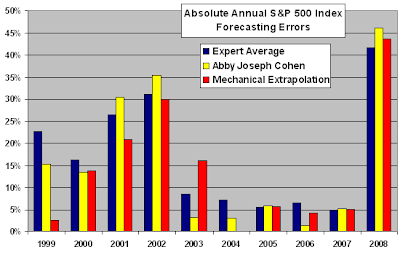 The following chart shows the absolute errors for Abby Joseph Cohen's annual S&P 500 index forecasts (yellow columns) along with: (1) the average absolute errors for the experts from the same-year Business Week forecasts (blue columns); and, (2) the absolute errors for annual mechanical extrapolations of historical S&P 500 index performance (red columns). There is slight evidence that Ms. Cohen is a better forecaster than the average expert but a worse forecaster than a simple algorithm. So it was not just "The Guru" who was wildly off in 2001, 2002, and 2008, every "expert" was wildly off in every bear market year since 1999. I guess you can only get to be an "expert" by constantly being bullish. Flashback January 27 2001: Goldman Sachs guru Cohen says extreme market volatility is over. One Of Wall Street's leading stock market pundits, Abby Cohen of Goldman Sachs, yesterday forecast a return to more normal stock market conditions after the turmoil of the last eighteen months and recommended that investors go overweight in technology stocks once more. How Did Cohen Get Her "Guru" Status? Inquiring minds are pondering the above question. I actually remember it well. It was called the "Shot Heard Around The World". In March of 2000, right at the peak of the bubble Abby Cohen announced a reduction in the stock allocation in Goldman Sachs' model portfolio from 70% to 65%. The market tanked big time on the day of the announcement. Seriously, that's it. Right before one of the biggest crashes in history she reduced her model equity exposure by 5%. You can find the rest of the story in SAY WHAT, Abby Joseph Cohen? How much is Goldman paying this perpetually bullish guru? Sorry, I do not have the answer to that question.